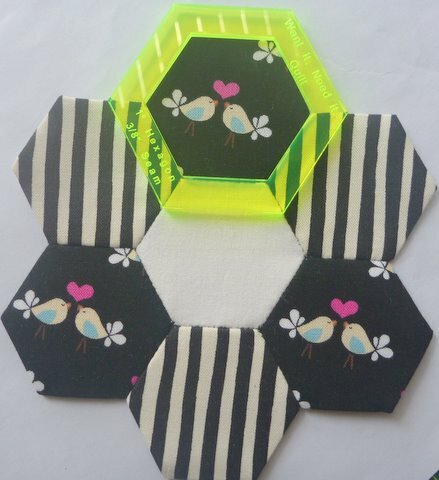 Click the button below to add the 1" Hexagon Templates to your wish list. 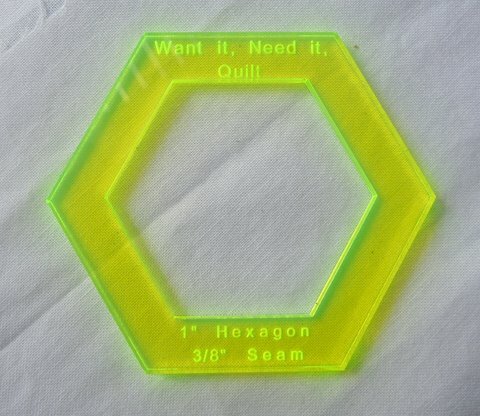 A great template for use with 1" sided hexagons. The design is perfect for fussy cutting fabrics. The template has 3/8" seam allowance. With the centre cut out it's perfect for fussy cuts and also easy to mark both the edge and seam allowance. I am never again buying a template that doesn't do this. The extra seam allowance means it's much less fiddly to baste and sew together, plus the fussy cut window makes fancy hexagons a breeze! I'm in the middle of a hexagon quilt and have been cutting my fabric without any templates so far. This is going to make my life much easier when I'm using prints that need fussy cutting. I really like that the seam allowance is 3/8" rather than 1/4". Very happy with this purchase! This is the most perfect product for fussy cutting those little 1" hexagons, it certainly makes life so much easier with it's little 1" window. I would also highly recommend this item as a great little gift that you you could send to a fellow quilter. It's cheap and light so you can just pop it in the post along with a nice card.